Welcome to 2016! This episode of The Shooting The Breeze Sailing Podcast features author and sailor Annie Dike, whose newest sailing book “Keys to the Kingdom” was just released last month. We chat about how she came, very recently, to the sailing world and how she’s been able to write two sailing books in the past three years. “Salt of a Sailor,” her first sailing book chronicles her second time ever on a sailboat, crossing the Gulf of Mexico, a delivery trip after buying a Niagra 35 in southern Florida. 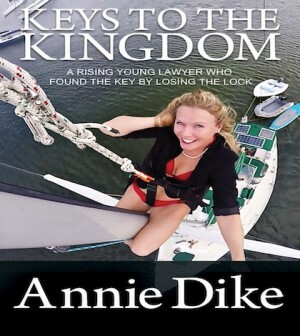 “Keys to the Kingdom” follows Annie on her second Gulf of Mexico passage back across the Gulf, as well as flashing back to her personal journey from being an unhappily married, fast paced lawyer, living in a McMansion, to wandering adrift into a Bar where she meets sailor and partner Phillip and casts off into the great unknown aboard that same Niagra 35. You can download the Episode by saving This Link.